Lanceleaf Philodendronis a large climber with climbing stems green, up to 20 m or more, 1-2 cm in diameter. Internodes are 1-2 cm, rooting. Leaf-stalks are green, sheathing from base to enlarged, 14-30 cm, base about 3 mm in diameter, at tip enlarged, 1-1.5 cm. Leaf blade pale green below, green above, curved-lanceshaped to ovate-oblong, rarely ovate, oblique, 25-40 x 10-13.5 cm, thickly papery, base obliquely rounded. 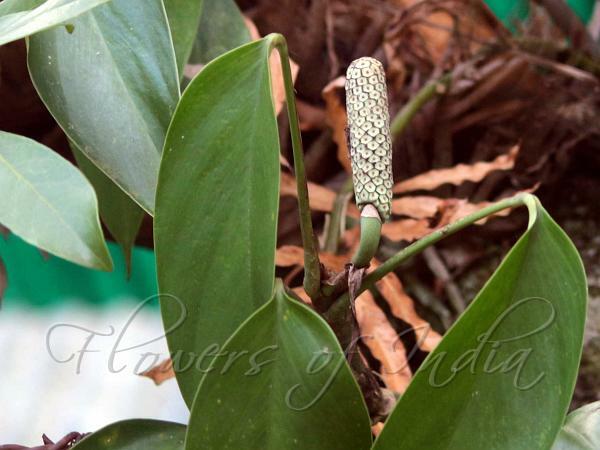 Inflorescences are borne at branch-ends, reduced leaves membranous, lanceshaped, about 10 cm, falling off; flower-cluster-stalk green, 7-10 cm, about 1 cm in diameter. Spathe is initially green, inrolled and tubular with a rostrum 2-3 cm, at anthesis spreading, orange on both surfaces, light green outside at center immediately after opening (green color soon disappearing), light yellow inside at base, boat-shaped in outline, about 12.5 x 10 cm, after anthesis falling off. Spadix is stalkless, cylindric, about 7 x 1.3 cm, tip blunt. Flowers are bisexual. Berry is gray-green. Seeds many, yellow, cylindric, 1.5-2 mm. 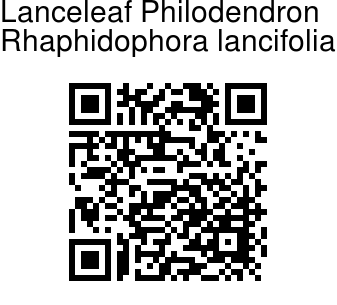 Lanceleaf Philodendron is found in rain forests, monsoon rain forests, creeping on trees, at altitudes of 500-2500 m, in W Guangxi, Yunnan, Bangladesh, NE India. Flowering: October-November. Identification credit: Hussain Barbhuiya Photographed in Shillong, Meghalaya.